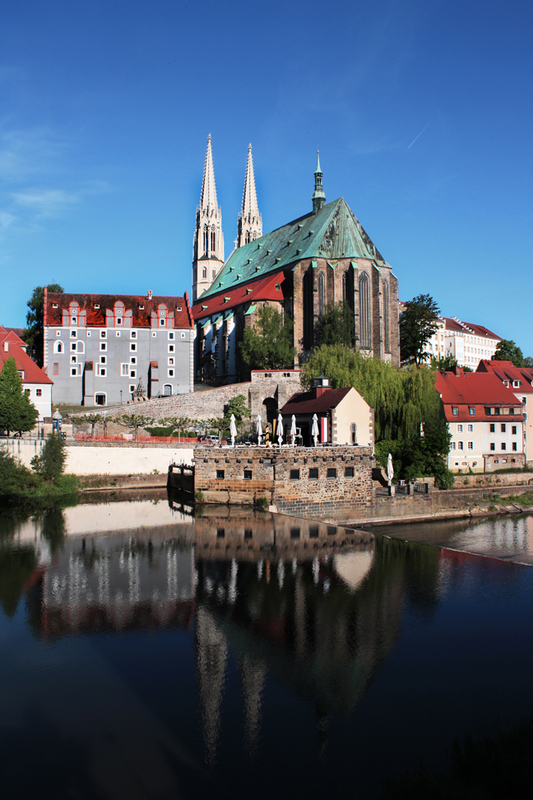 The most well-known church in Görlitz is the Peterskirche (Church of St. Peter and Paul), which towers over the Neiße river, its twin spires giving the city its unique silhouette. 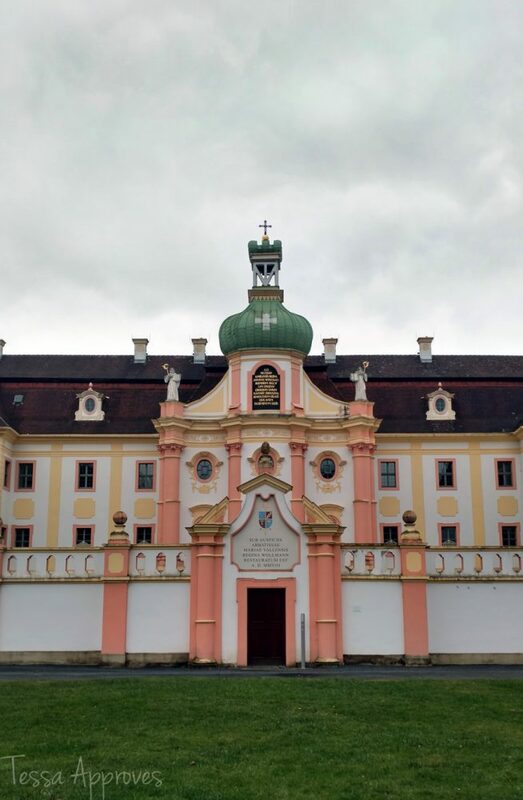 This church is beautiful both inside and out, with its Baroque decorations and famous “sun” organ. 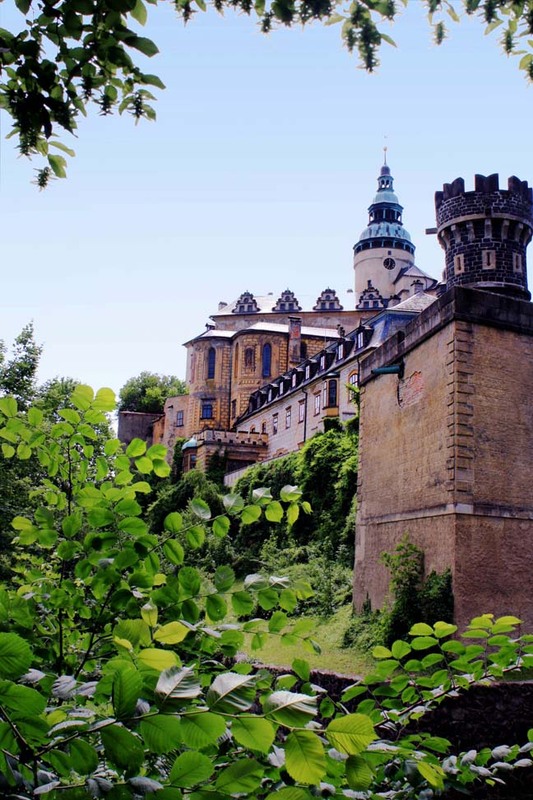 Cross the Old Town bridge for a beautiful view of this church or climb the 131 steps up to a platform between the spires for a beautiful view west of the city. 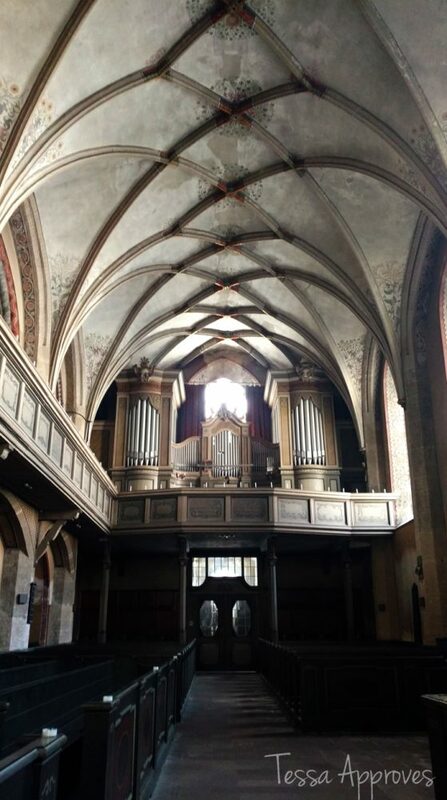 The church is free to visit and has frequent organ concerts. 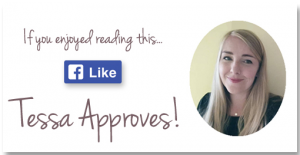 Click here to read more about the church, see pictures of the interior and hear the legend of the builder who plunged to his death from the roof because he was distracted by a pretty girl! The Nikolaikirche is actually not a church anymore, but houses an art installation honoring the fallen in WWI. 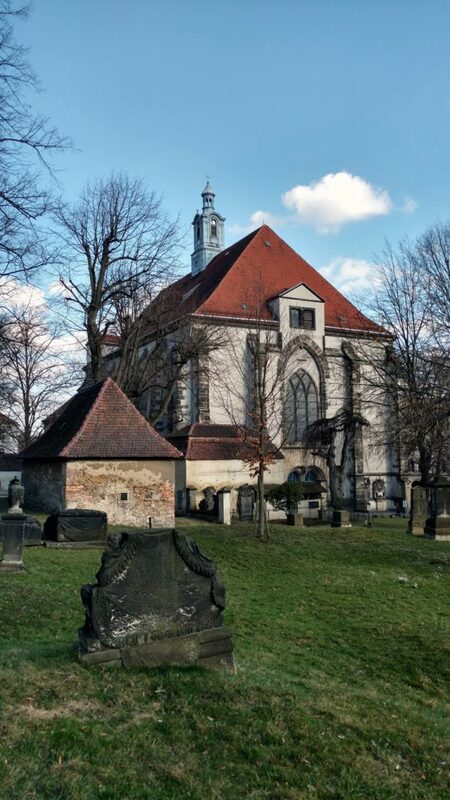 The real draw here is the amazing, historic graveyard surrounding this church which makes for a beautiful & peaceful walk through the history of Görlitz. Read more about the church and its graveyard here. 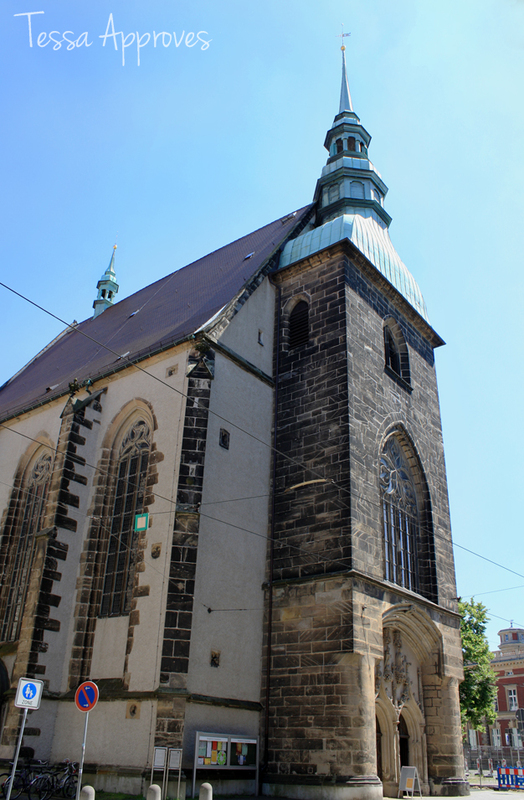 This church is located right in the city center next to the famous Kaufhaus, the tram lines, and the shopping center. But the Frauenkirche has a fascinating history and used to be in a lot quieter surroundings, outside the city walls. 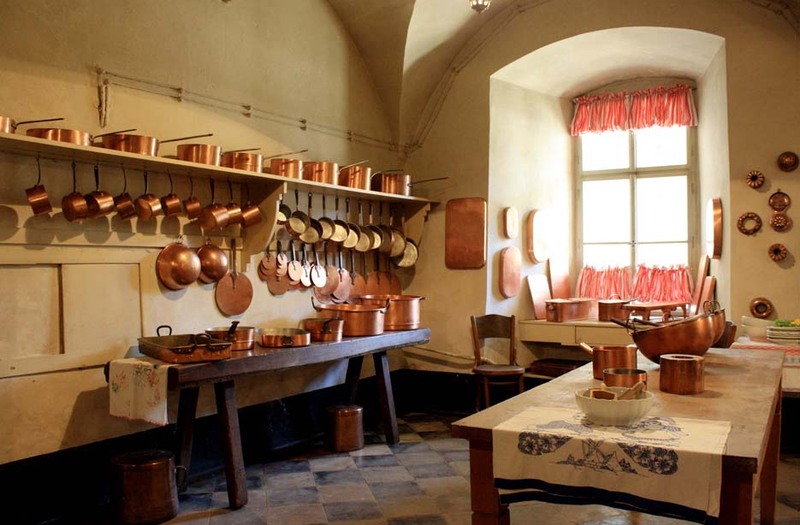 Read more about its past and see pictures of the interior here! 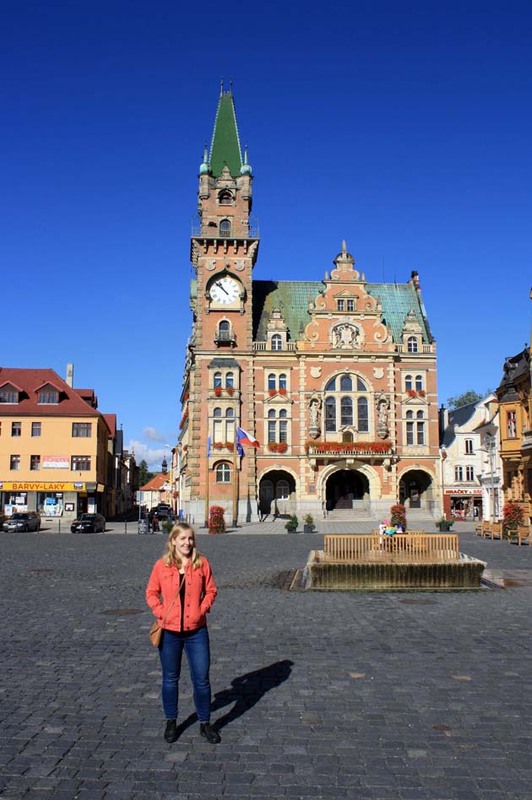 These post-Reformation churches are located outside of the city center but are also beautiful and worth a look if you are in the neighborhood! The Frauenkirche in Görlitz sits right in the center of the city, surrounded by the tram, the famous Kaufhaus and a shopping center. It wasn’t always in such a crowded spot, however. 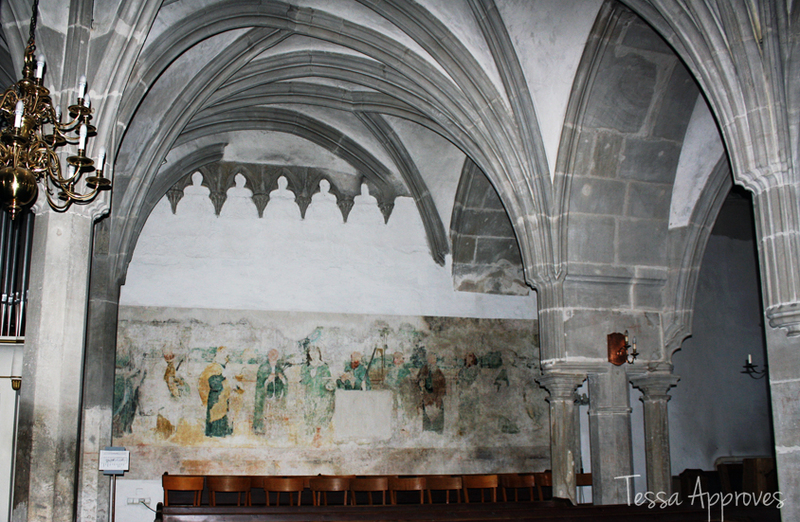 When the church was first built in the 1300s, it was outside of the city walls. 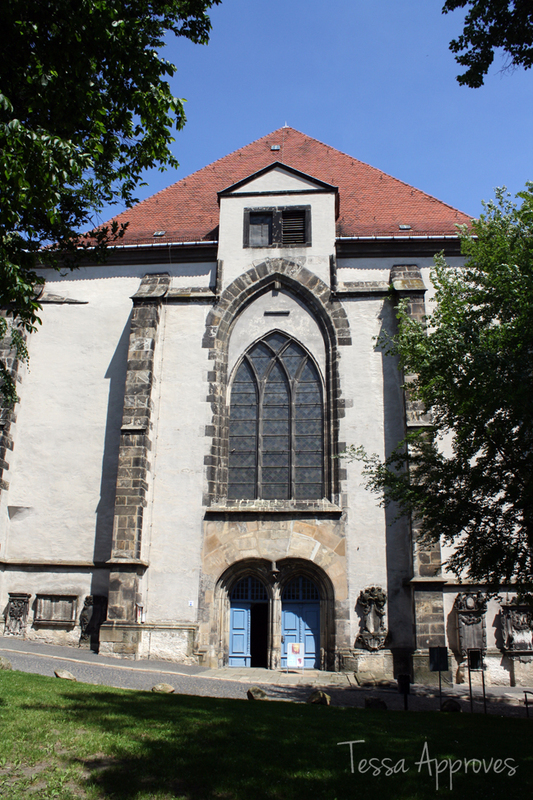 The Frauenkirche is the youngest of the pre-Reformation churches in Görlitz. 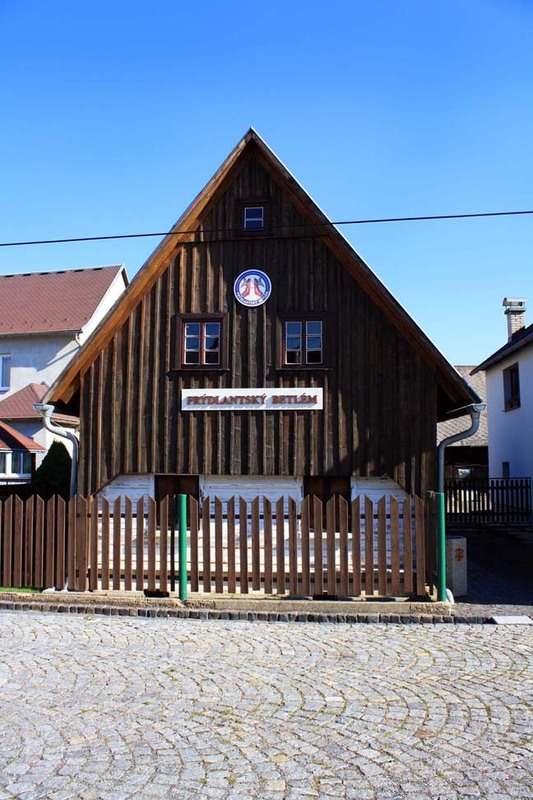 The three-naved Protestant church was first likely a wood structure and then eventually rebuilt in late Gothic style. 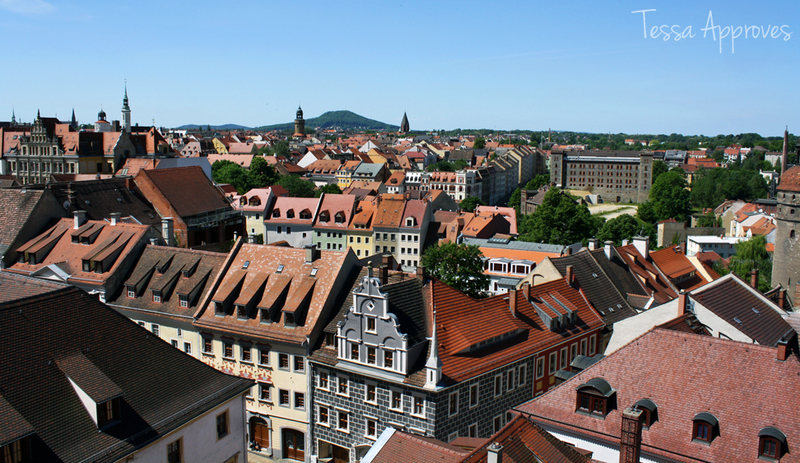 In 1349, Görlitz asked a powerful local lord, Friedrich von Bieberstein, for help. 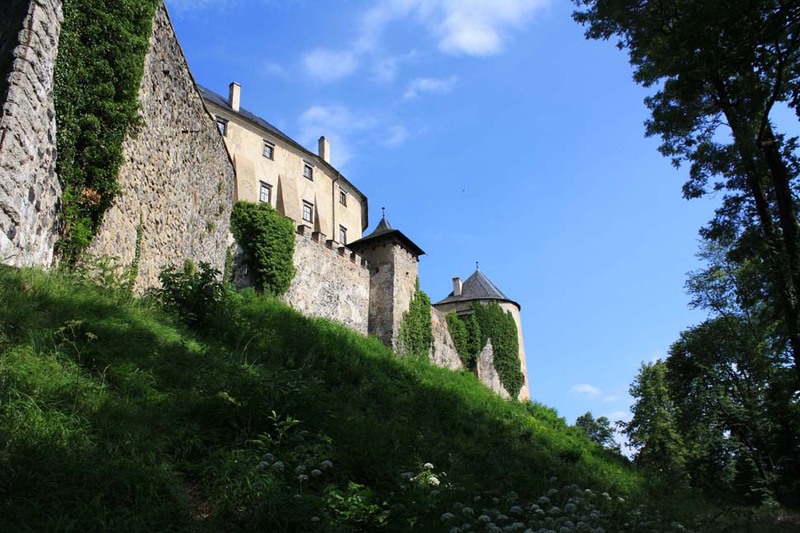 He ruled over parts of Bohemia and had a castle in Friedland (now Frydlant in Czechia). 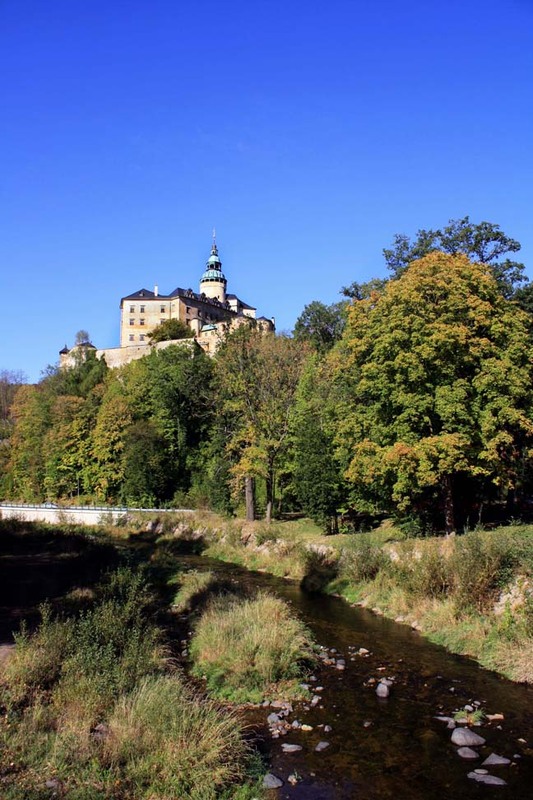 The town of Görlitz needed help apprehending and arresting a “disturber of the peace” named Nitsche von Rackwitz. They asked the lord for help and it was promised, but when no help came, some armed citizens decided to take matters into their own hands. They tracked down von Rackwitz and found him hiding on von Bieberstein’s lands. But when Bieberstein found out that the men from Görlitz were on his land, he declared them invaders and had them attacked by his men. Seven of the men from Görlitz died. The city of Görlitz was very upset about this betrayal. After some back-and-forth, von Bieberstein decided to try to make amends by funding the building of a new church, the Frauenkirche. It would be a hospital church outside of the city walls with a graveyard. However, the money he gave was insufficient and the building stalled until the plague came along, making the completion of the church and its graveyard more urgent. The Frauenkirche was never the most popular church in the city, the Peterskirche was inside the city walls and had a large congregation. However the church grew in importance after the extension of the city in 1840 to the south. The wall surrounding the church and the graveyard were removed to make way for the extension, a few gravestones remain on the outer church walls today. 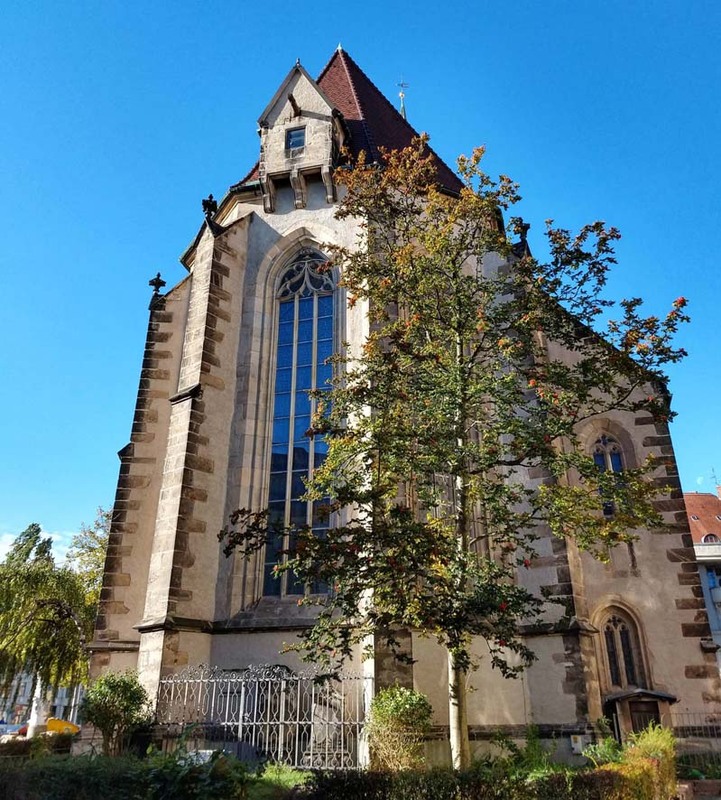 In 1989 during the peaceful revolution in East Germany, the Frauenkirche was the first church in the city to hold prayers for peace, a weekly meeting of people on Monday who would meet and then march peacefully, protesting the East German government. The church is very simple inside and out with three aisles, vaulted ceilings and high windows. The organ which was added in the 1970s had to be renovated recently. 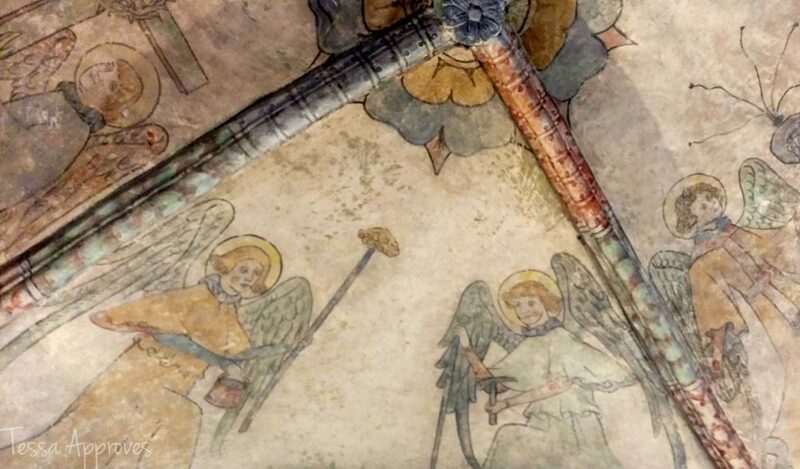 During renovations, 500 year old graffiti was found in the room behind the organ on the walls, probably left behind by pilgrims. 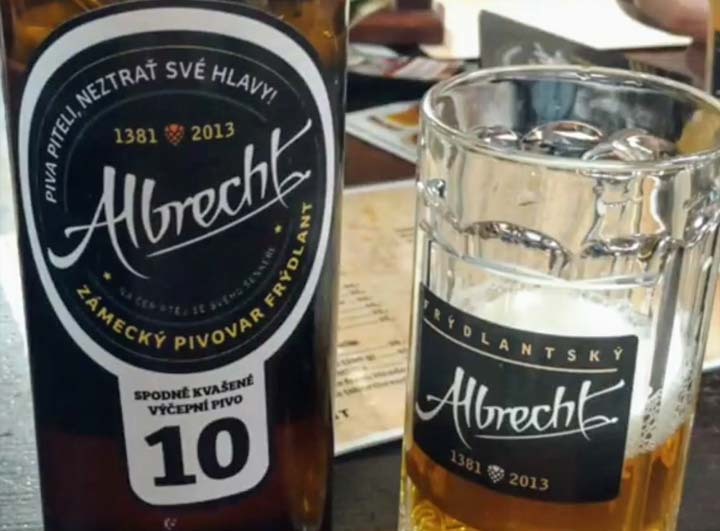 They are similar to the markings on the Holy Grave in Görlitz, another popular place of pilgrimage. Although the Frauenkirche isn’t the most beautiful church in Görlitz, it has a fascinating history and still has highly attended services and concerts. The church is open seven days a week until 6pm to visitors and entrance is free. Permission to take photographs costs €1.50. 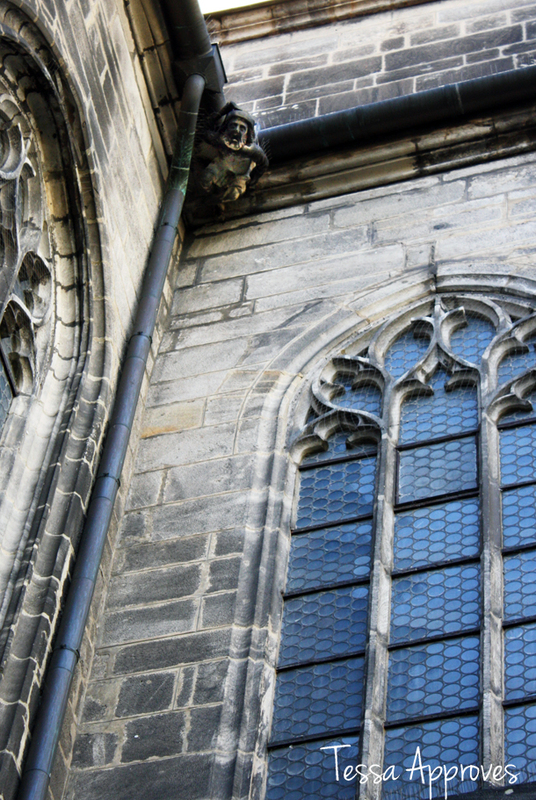 Click here to find out more about the other historic churches in Görlitz! The St. Peter and Paul Church is the most recognizable structure in Görlitz, towering over the Neiße and dominating the city’s silhouette with its twin spires. I’ve been fortunate enough to live directly across the street from this impressive structure – I get to listen to the church bells ringing to call people to services or organ concerts and see the colors of the sunset glowing on the church’s stones each evening. There has been a church in this location on the Neiße river since the 11th century. 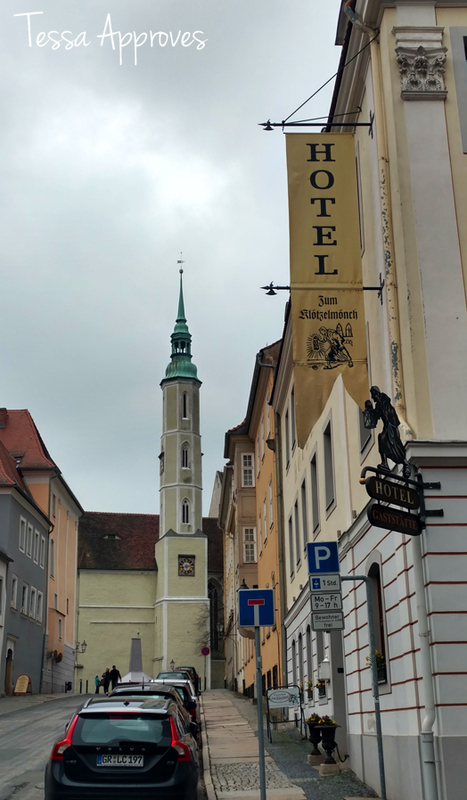 It wasn’t until 1372 that it became the main church for the citizens of Görlitz, instead of the Nikolaikirche which was outside the city walls. In 1691 much of the late Gothic interior was destroyed in the fire and it was redecorated in Baroque style – these decorations are on display today, including ornate confessional cabinets which left the person giving confession exposed to public view. Instead of confessing to a clergyman, they confessed their sins to God in the Protestant style. 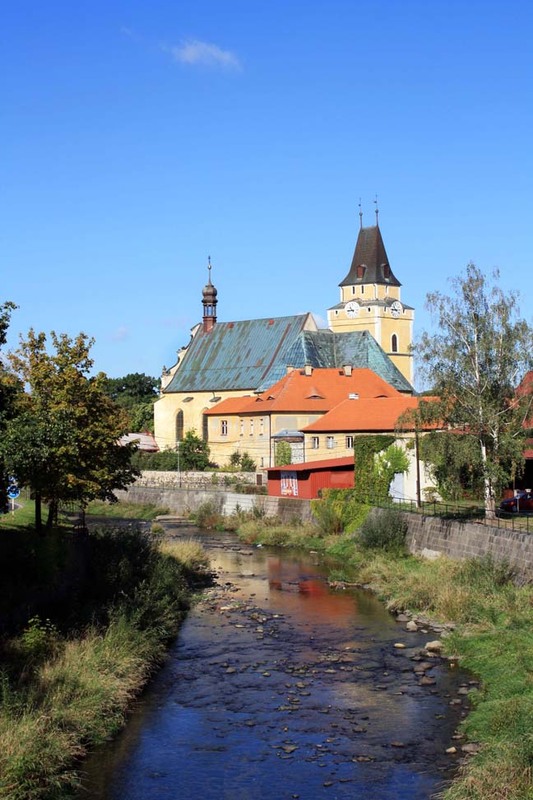 The church nearly escaped damage during World War II (as did most of Görlitz)- however some windows were blown out when the Wehrmacht detonated all of the bridges during their retreat at the end of the war. 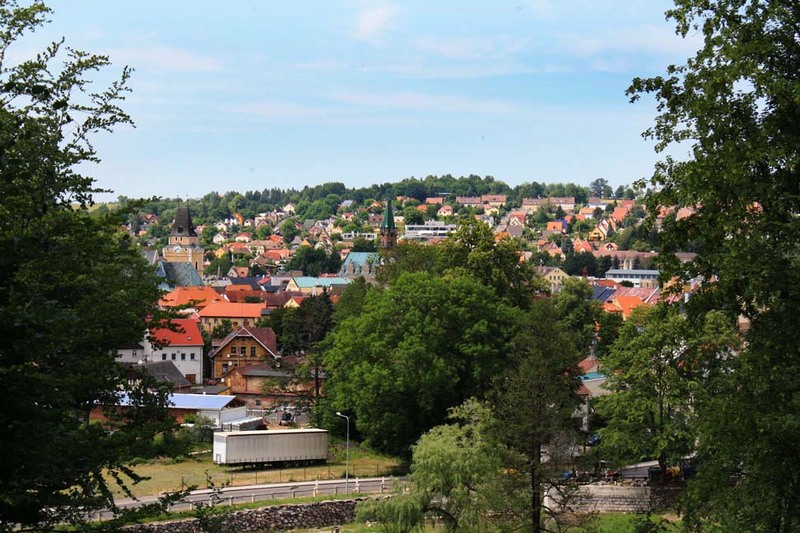 If you are willing to climb the 131 steps to the platform between the two spires, you will be rewarded with a beautiful view of Görlitz to the west. Be sure to go up in the morning for the best lighting. The 84 meter high spires, which give the church its distinctive silhouette, were added in 1891. The famous Sun Organ inside the church was built in 1703 by Eugenio Casparini and features 18 sun faces around which the organ pipes radiate. The original organ had to be retired due to wear and tear in 1979 and a very close replica was created in 2006 thanks to donations. 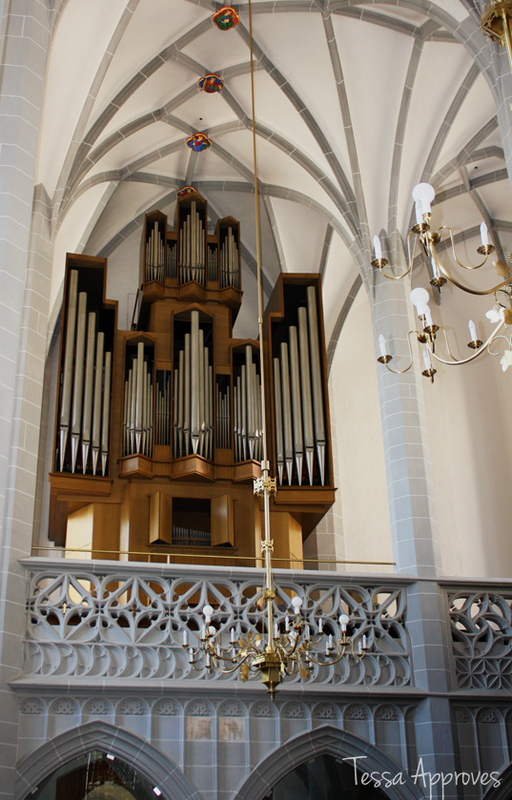 The church hosts frequent organ concerts – check the bulletin board outside for a chance to hear it played. 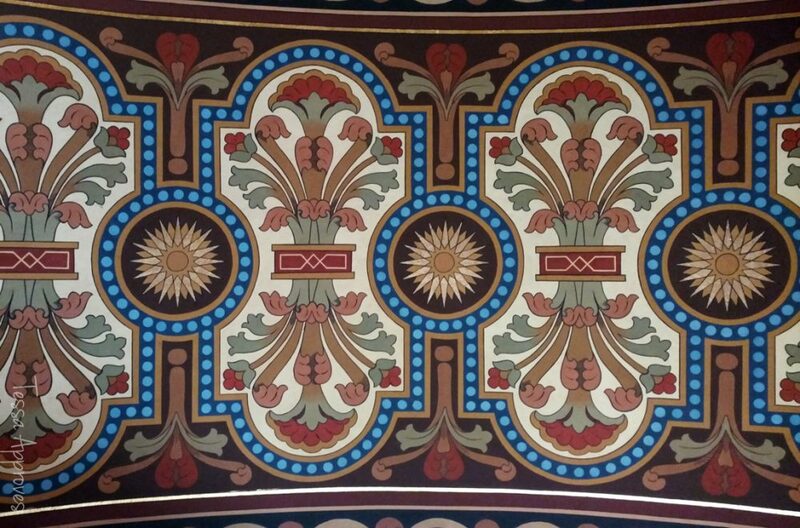 When visiting old churches it’s really important to pay attention to the details. They are filled with symbolism and every figure has a meaning or a story. Every time I point my camera lens at this church, inside or out, I find new and fascinating details. 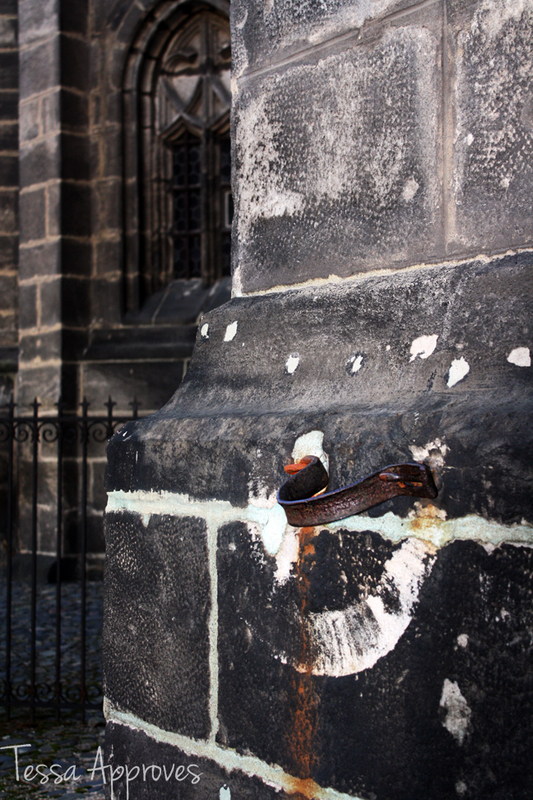 It’s said that this iron neck chain on the east side of the church exterior was used until the middle of the 17th century to publicly humiliate wrongdoers. Directly above you can see stone carvings of a pig and a monkey, perhaps symbols for human failings. On the east side of the church on the river is the lower church, or the crypt, named after St. George (Georgenkappele), which and built in 1457. 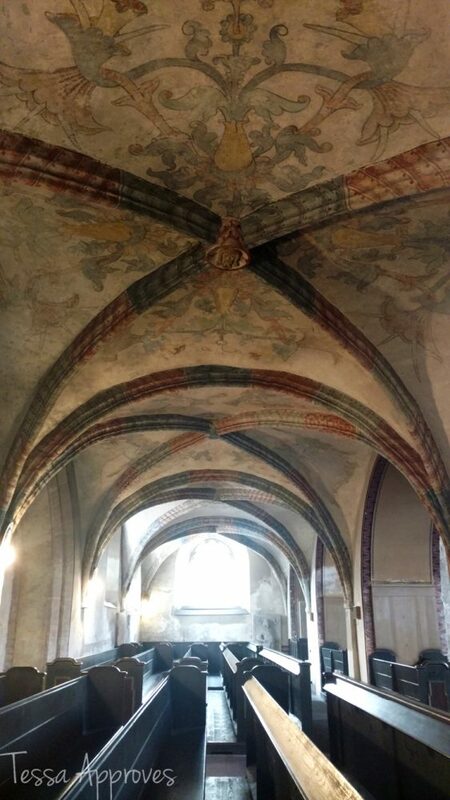 The crypt has beautiful vaulted ceilings and a recently revealed fresco painting of Christ and his 12 disciples. The decision was made to leave it as it was found instead of trying to restore it. The crypt is called the Winter Church because it’s the only part of the church that can be heated – services are held here in the winter. Every year on Good Friday a procession begins here in the crypt where they reenact the stations of the cross – a man along with a procession, carries a cross to the Heiliges Grab in Görlitz, a replica of the Holy Sepulchre in Jerusalem built in the the late Middle Ages. There is a legend about a man who was working on the roof of the Peterskirche. He stopped to look at a pretty girl below and distracted, he lost his footing. As he fell, he wedged his axe into a nearby beam in an attempt to hang on for dear life. The townspeople came with feather beds below to try to cushion his fall, but in his anxiety he missed the landing and fell to his death. 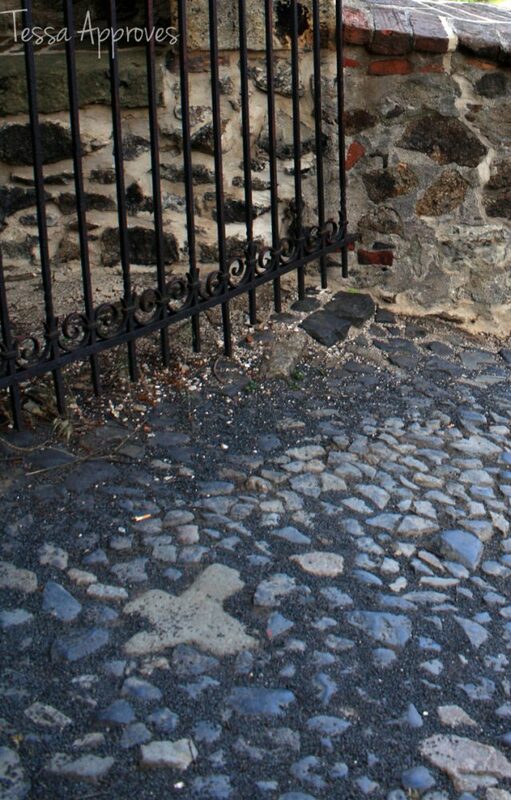 As evidence for this legend you can find a cobblestone shaped like a cross where he supposedly landed as well as the stone figure of a man above the door to the crypt. Is the legend true? It turns out, a man did in fact fall to his death from the roof of the Peterskirche, his gravestone can be found in the Nikolaifriedhof and it states that Franz Hesse, 22 years old, fell to his death in 1776. 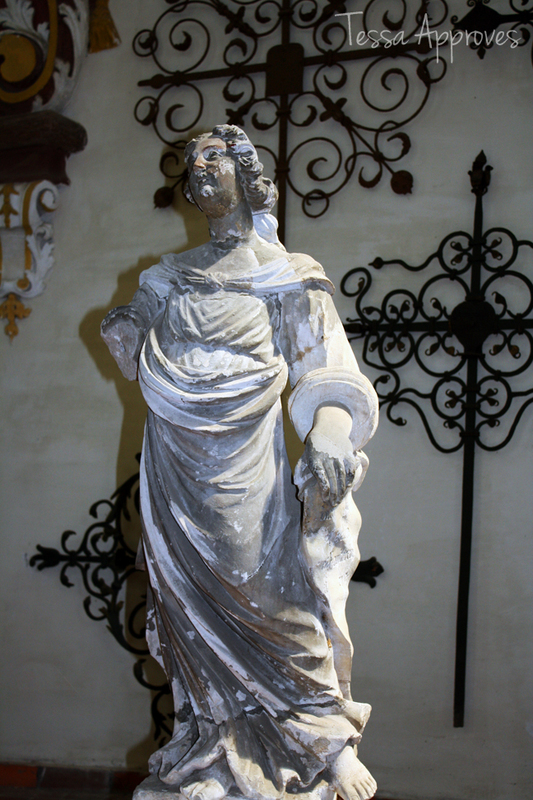 However, the stone figure of the man on the church which is associated with the legend predates this man’s death. 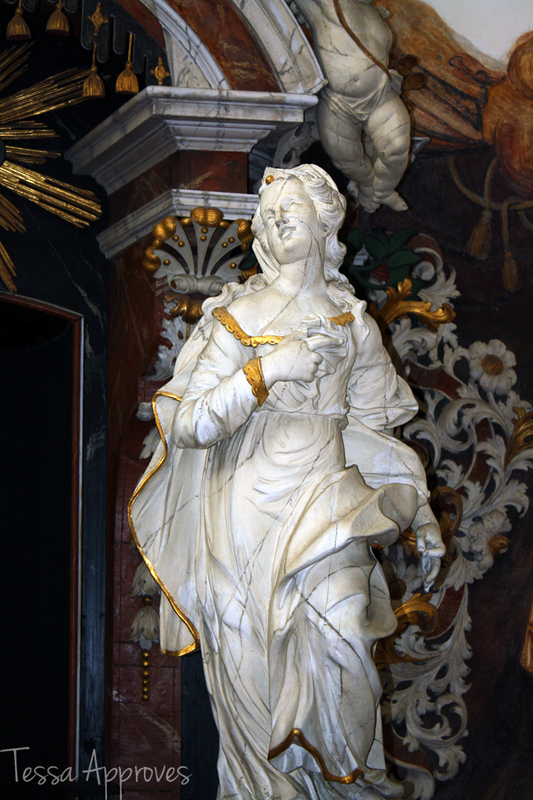 The Peterskirche in Görlitz is open to visitors Monday – Saturday 10:00-18:00 (until 16:00 in the winter). 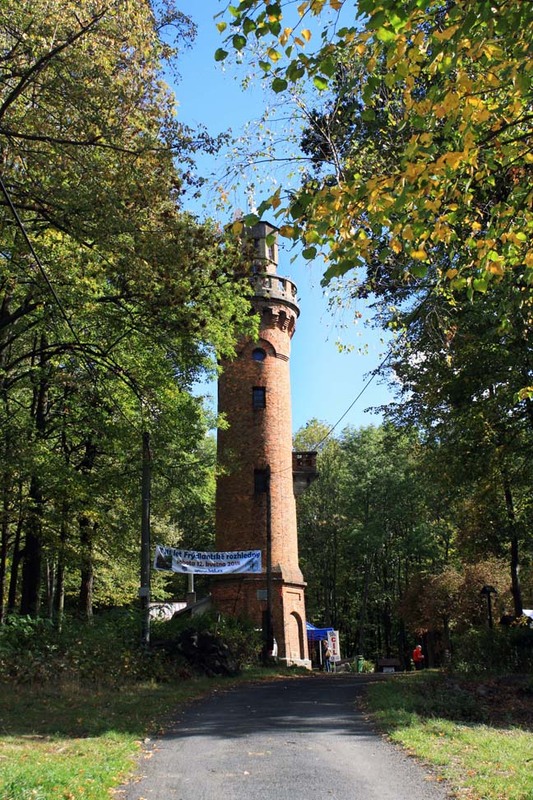 Entrance is free, however there is a €1.50 fee to take photographs and €2.00 to climb to the viewing platform between the spires. The Nikolaikirche is a church northwest of the old town in Görlitz named after St. Nicholas, the patron saint of merchants. The church is just around the corner from the home we are renovating in the quiet neighborhood of Nikolaivorstadt. 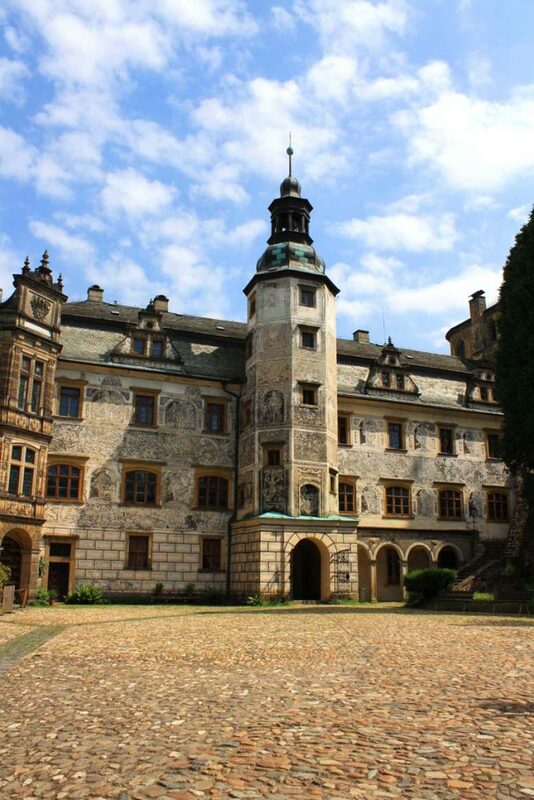 It sits at the foot of the historic Nikolaifriedhof graveyard and the larger city cemetery. It’s also one of the oldest churches in the city – a church has existed in this spot since 1100. 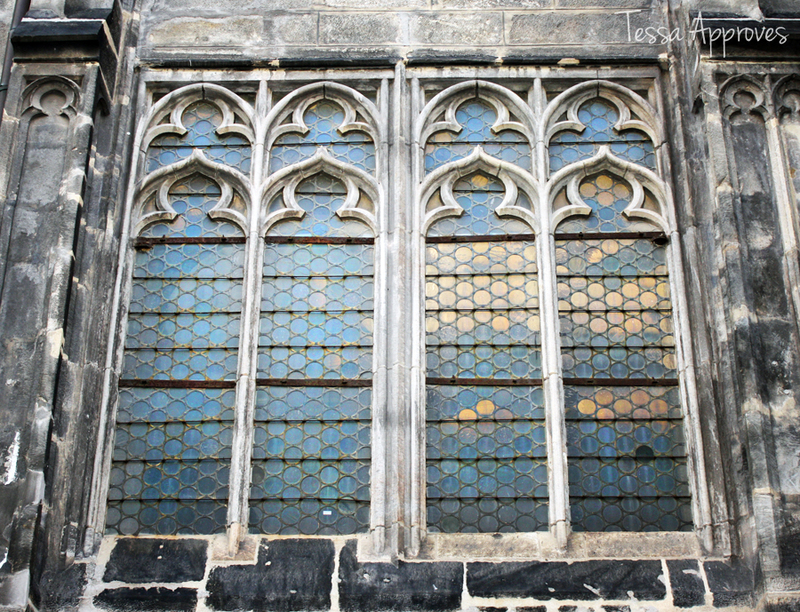 In 1452 building of the late Gothic style church began but slowed down and stalled in favor of the building of the Peterskirche within the city walls. In 1516 Wendel Roßkopf the Elder took over the building of the church. 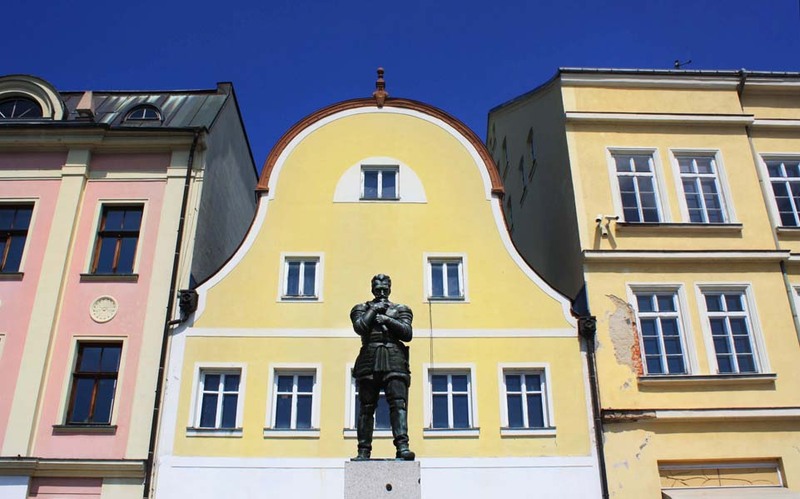 He was a master builder and town councilman in Görlitz- most notably he built the Schönhof (current home to the Silesian Museum) and designed the archives wing of the town hall. 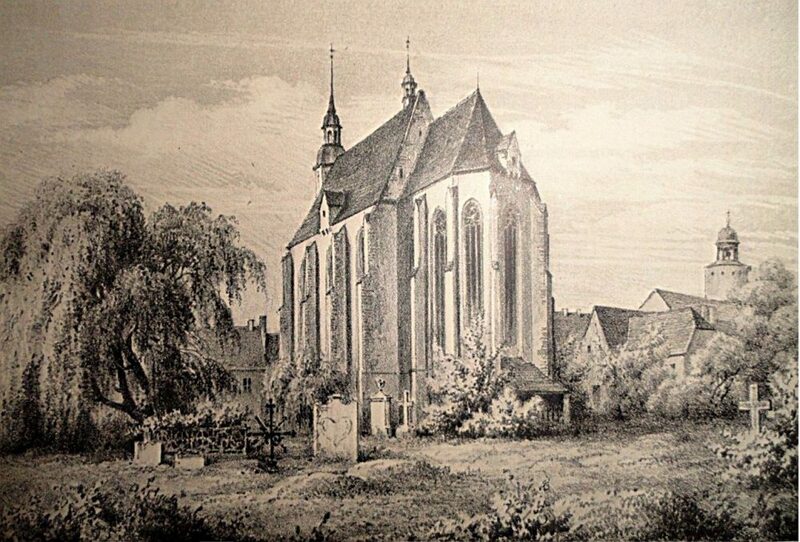 In 1520 the new Nikolaikirche was consecrated but would unluckily be burned down twice: in 1642 during the Thirty Years’ War and in 1717 during the town fire. 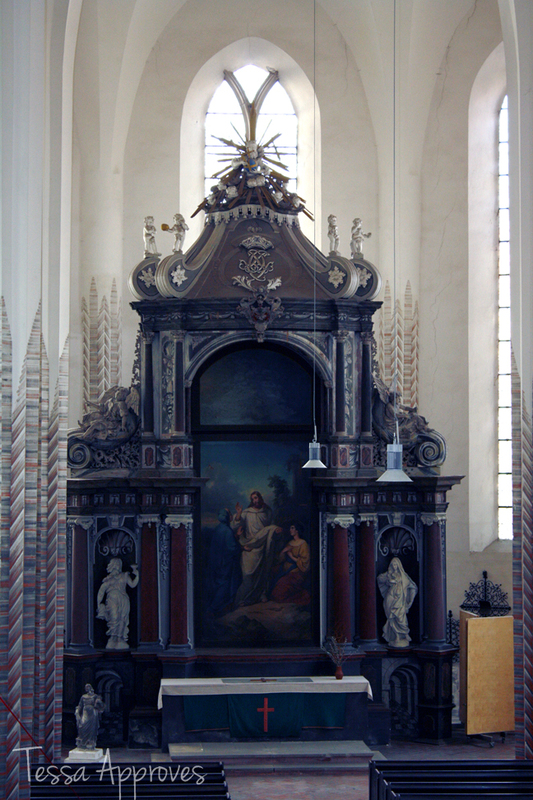 Most of the citizens of Görlitz attended the Peterskirche after its consecration in 1497 and the Nikolaikirche served mostly as a burial church for the city. 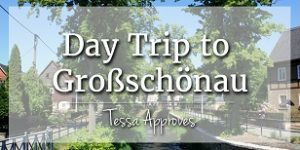 The Nikolaifriedhof (cemetery) is one of the oldest and most beautiful in Germany and happens to be one of my favorite places for a peaceful walk in the city! 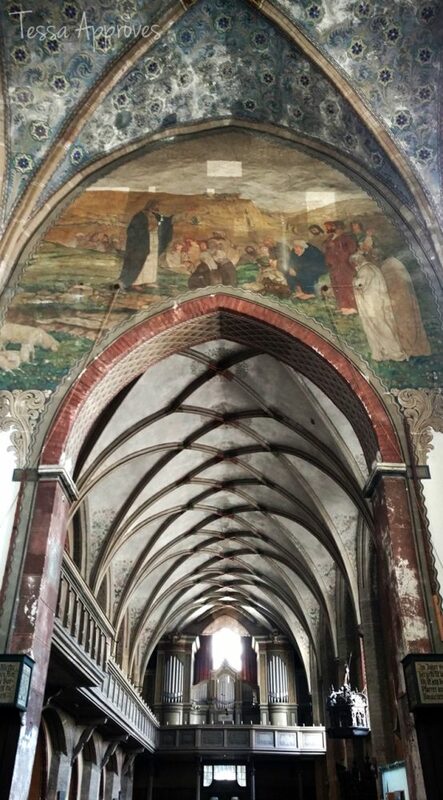 While the interior of the Nikolaikirche isn’t as beautiful as other churches in Görlitz and appears in many ways to be incomplete, it serves a different purpose today. 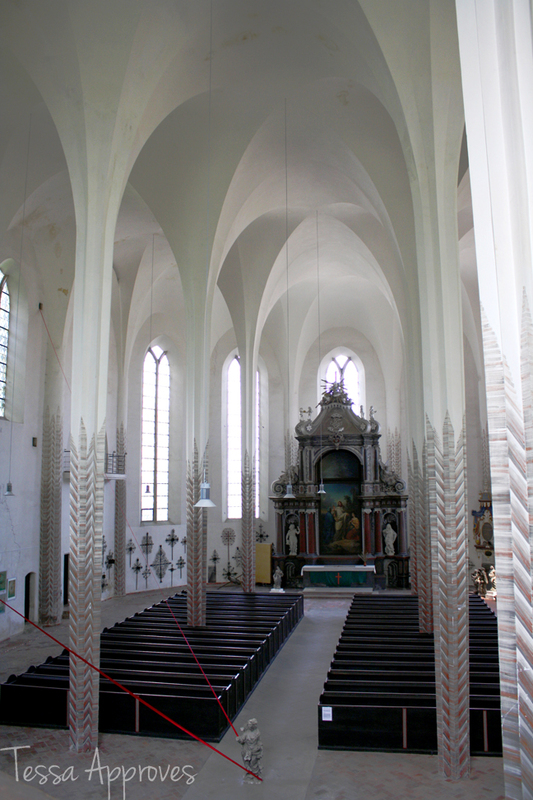 In 1925/26 the interior of the church was transformed into a memorial to the fallen Protestant soldiers of World War I. 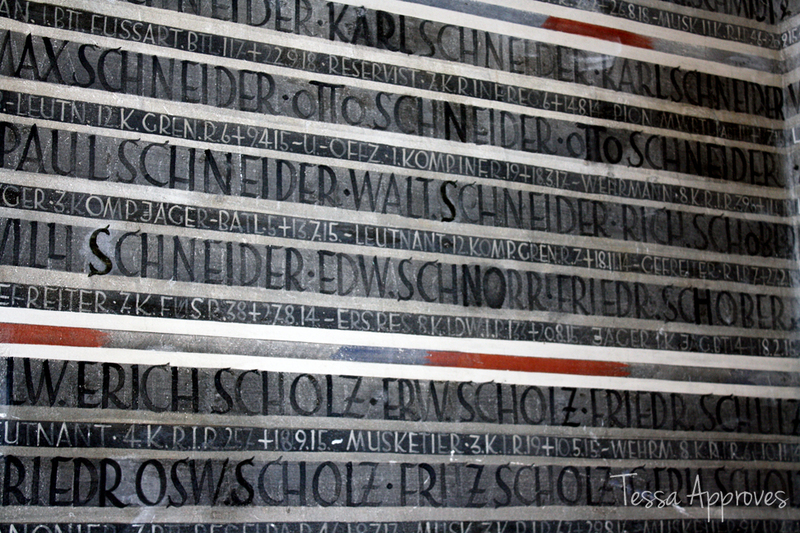 The memorial was designed by Prof. M. Elsässer in expressionist style and lists the names of the city’s fallen on the walls. 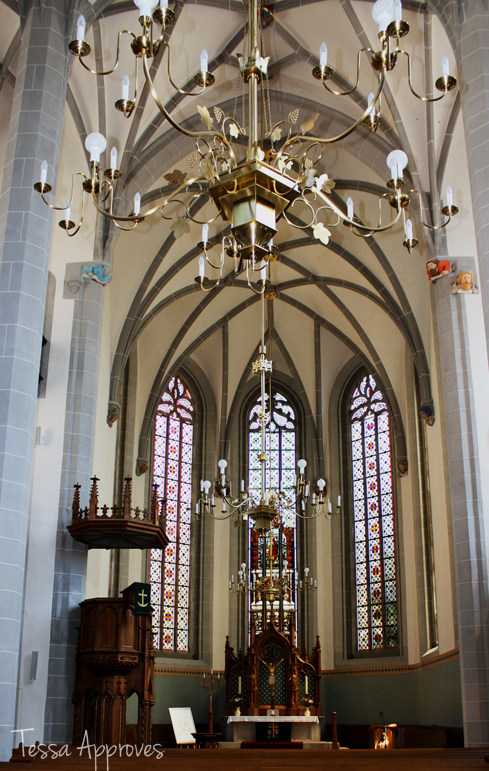 The Nikolaikirche is open to visitors in March through October with a €2 entrance fee. Entrance to the cemetery is free and you can read more about it here. I wasn’t expecting a lot from the interior of this church. The exterior is slightly less than thrilling. It’s also a Protestant church, and those tend to be plainer than their Catholic counterparts. Dreifaltigkeit means trinity in German and this church is situated on the Obermarkt in Görlitz. I’ve walked by it often but never really been curious about the inside. It looks kind of sooty and unremarkable. But I learned my lesson, never judge a church by its, uh…cover. The first thing you see when you walk towards the entrance is a sign saying that it costs €1.50 to photograph inside this church. Entrance, however, is free if you’d just like to have a look. At first I balked at the fee, but I was happy to pay it once I saw the inside. 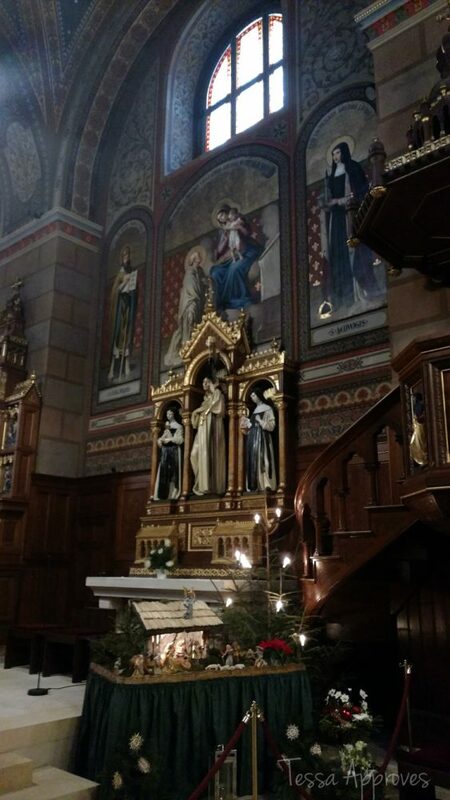 When I walked in I was floored by the beautiful vaulted ceilings, the ornate paintings and altar. It’s got kind of a dark & gloomy vibe even though there’s so much light pouring through the windows. The church was first built in the 13th century as an abbey for the Franciscan Monastery alongside the former city wall. 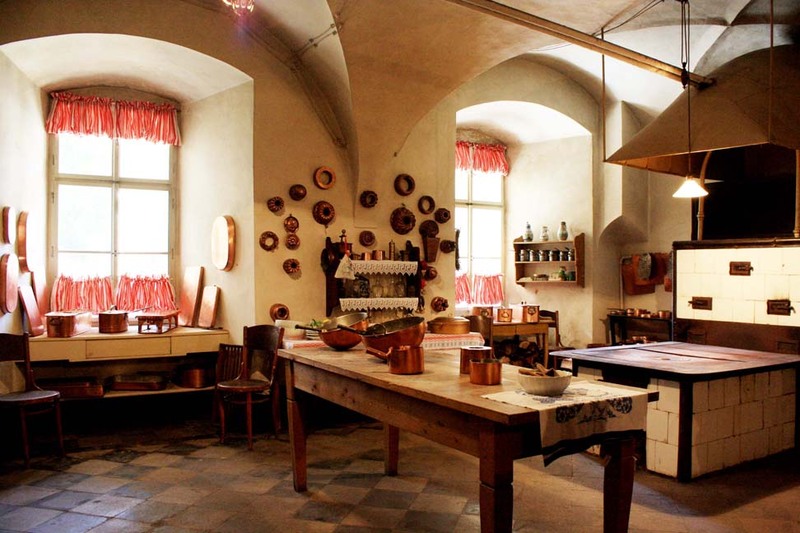 It was a simple church built along the guidelines of religious order of the monks who adopted a lifestyle of poverty and went barefoot or only in sandals. 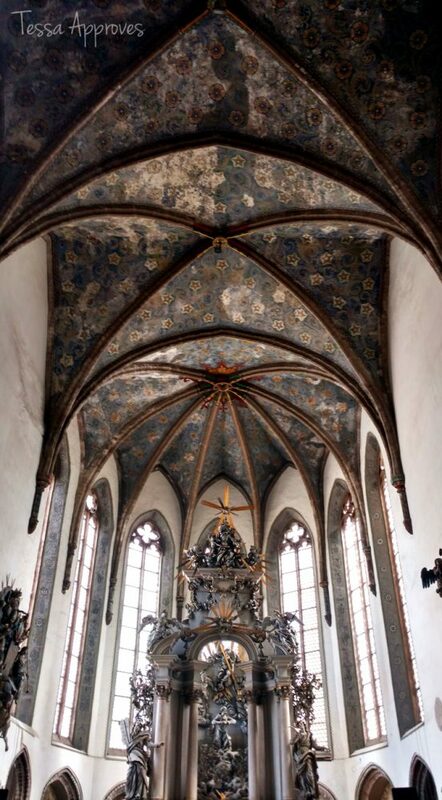 There are several popular legends that everyone in Görlitz knows and there’s a legend about this church set during the time that it was a monastery in the middle ages. It’s pretty creepy – don’t say I didn’t warn you. 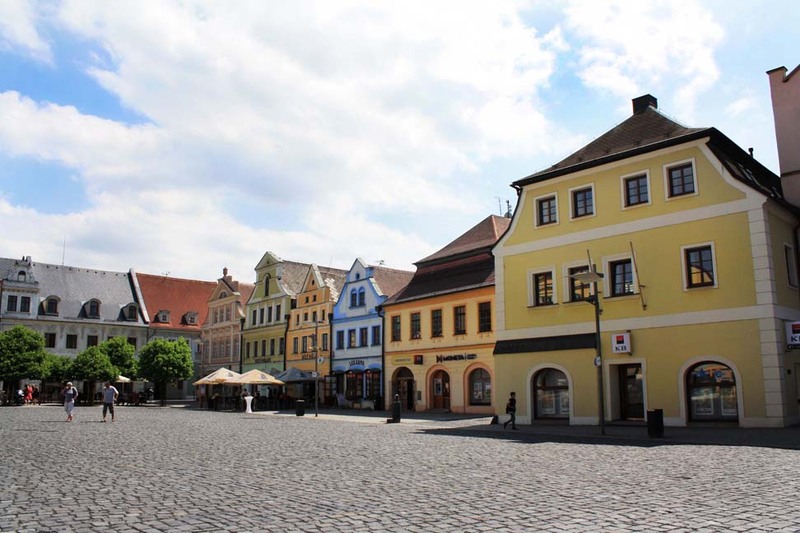 A traveling journeyman made his way to Görlitz on foot and was exhausted from his journey when he reached the church on the Obermarkt. He went inside to pray and fell asleep on a pew in the back. He was awakened late at night by a strange shuffling sound and became frightened and hid. From his hiding place he saw a monk with a hideous face, shuffling along in wooden slippers. The monk was dragging the lifeless body of a little girl. Scared out of his wits, the man remained hidden and watched as the monk hid the girl beneath a grave stone in the church. 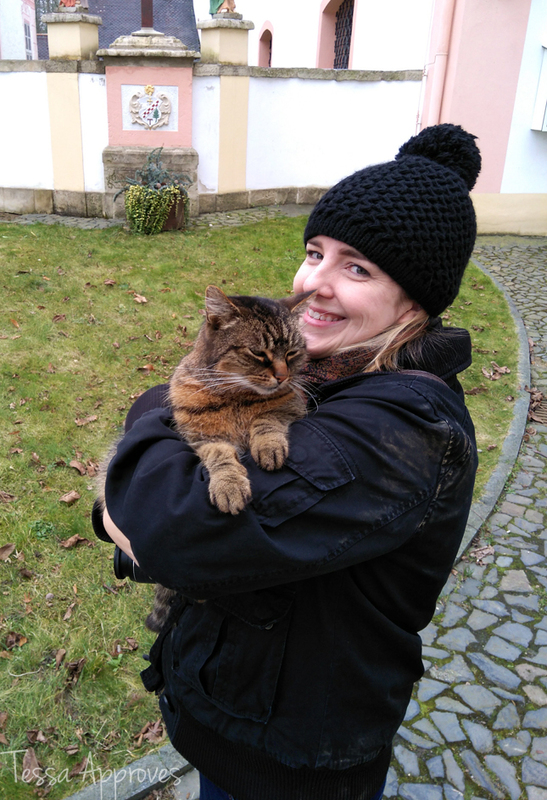 Hoping it had all been just a bad dream, the man left the church the next morning but around Görlitz he heard that there was panic because a mother on Fleischerstraße was missing her daughter. The young girl had attended mass as usual but had not returned home. Hearing this, the man immediately went to the authorities and reported what he had seen. Because of the monk’s hideous face, he was easily identified. When confronted he did not deny his crimes. He admitted to attacking the girl, having been unable to keep his oath of celibacy. 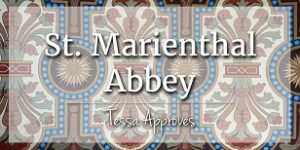 In order to hide his crime he had murdered her and hidden her body in the church. The monk was sentenced to be walled-in alive but his spirit is said to have never found rest. Supposedly you can still hear the shuffling of his wooden slippers in the church today. 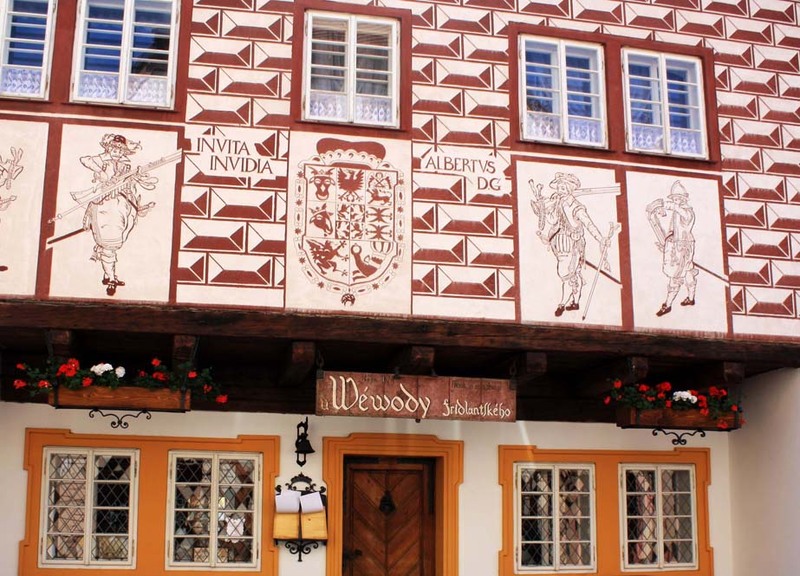 Today there is a hotel and restaurant located on the Fleischerstraße where the widow with the missing daughter lived, it’s called Zum Klötzelmönch. 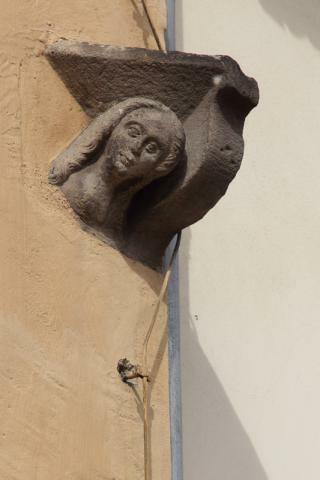 Next door on the orange building high up you can see the statue of a woman’s head, they call this the “waiting mother”. 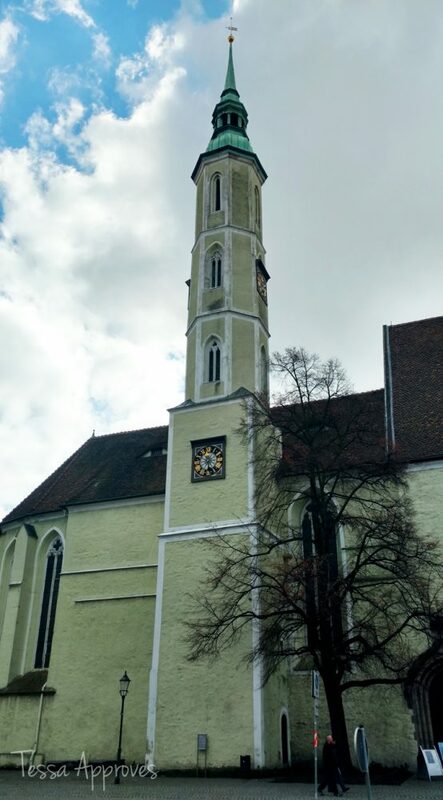 The Dreifaltigkeitskirche was expanded and changed in appearance over the centuries. 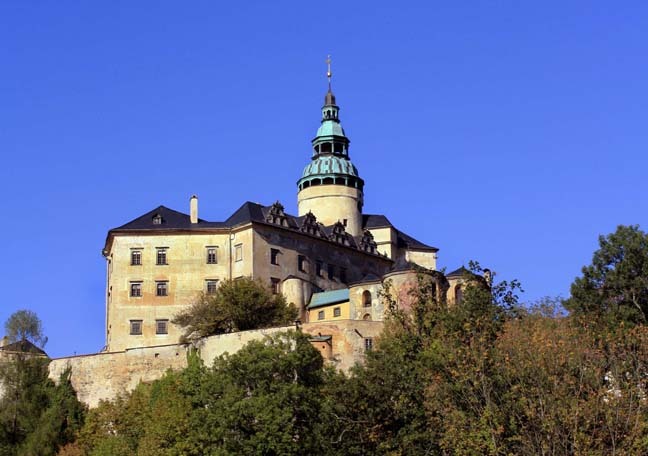 After the Reformation the Franciscans left the monastery and handed it over to the city to be used as a school. The church became Protestant. 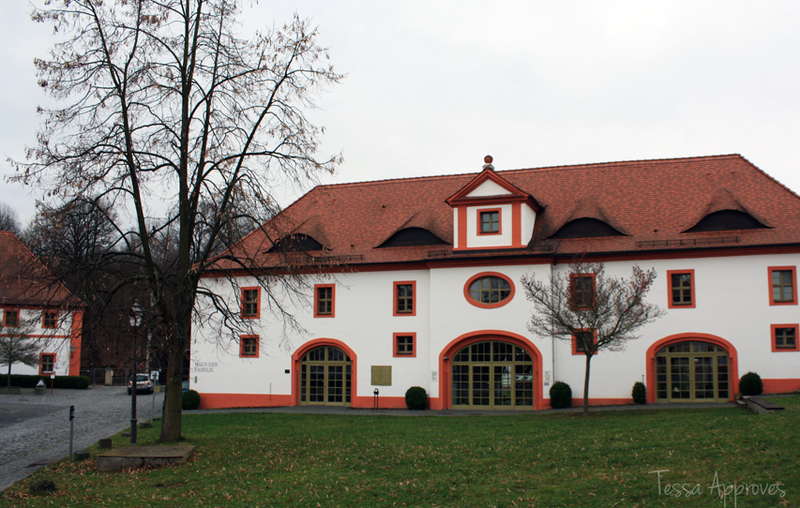 The building adjacent to the Dreifaltigkeitskirche is still used as a school today, the Augustum-Annen-Gymnasium. 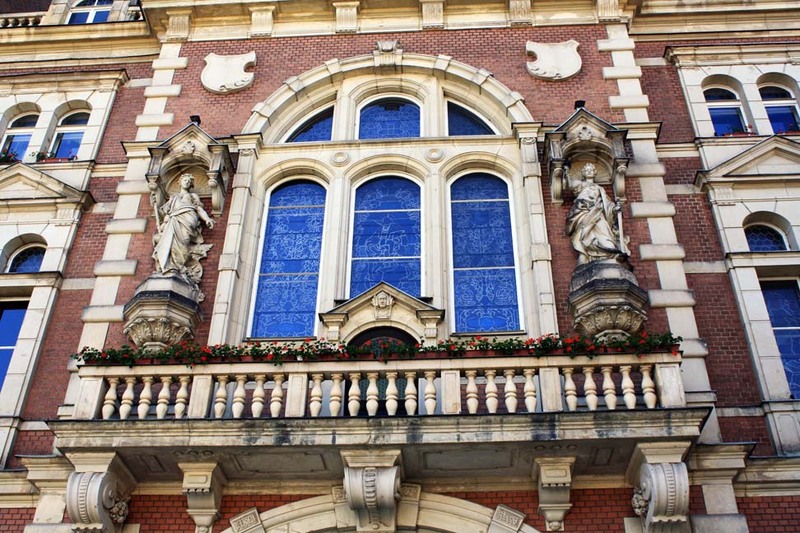 Can you imagine going to high school in a gorgeous building like this? We certainly didn’t have high schools like this in Arizona! I, for one, am glad that I hadn’t heard the story of the creepy monk in the wooden shoes until after I visited the Dreifaltigkeitskirche! I can imagine myself going inside this church when the weather gets warmer and having a seat in a pew to get away from the heat and stress and just reflect, but now I will imagine falling asleep and waking up to the sound of shuffling wooden shoes! 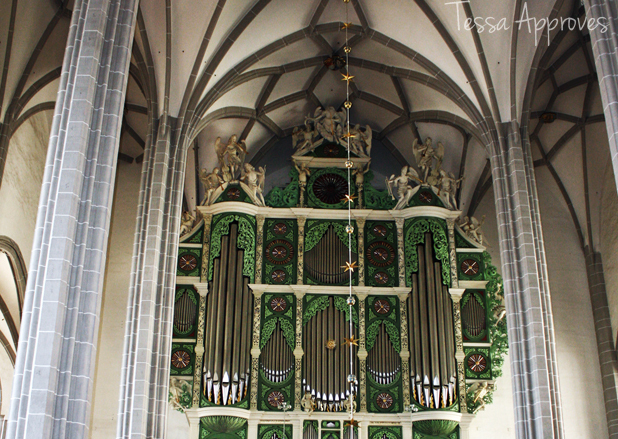 If you are touring Görlitz you should definitely check out the Dreifaltigkeitskirche for its beautiful interior. 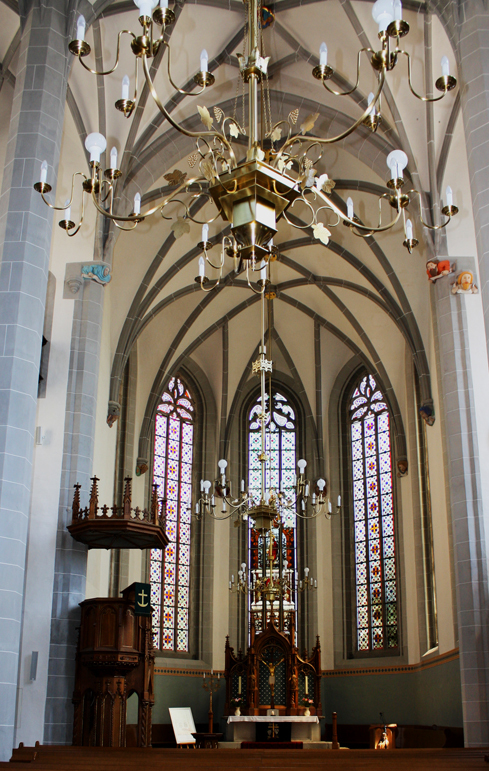 Because it was originally a Catholic church, the interior is more ornate than many Protestant churches tend to be. 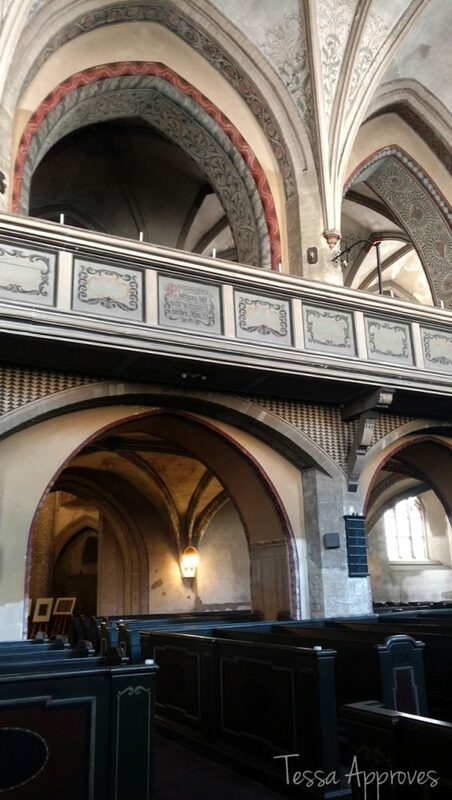 Dreifaltigkeitskirche is definitely worth a peak inside while you’re on the Obermarkt!